However there are a number of simple things that you need to do repeatedly which would be a bit of a pain to use the Views every time to do these. So in our .Net API we provide a number of APIs that give you efficient quick mechanisms to access things like company, fiscal calendar and currency information. With Sage Summit 2014 just a few weeks away (you can still register here), I can’t pre-empt any of the big announcements here in my blog (as much as I’d like to), so perhaps a bit of an easier .Net article instead. For many these examples are fairly simple, but I’m always getting requests for source code, and I happen to have a test program that exercises these APIs that I can provide as an examples. This program was to help ensure and debug these APIs for our 64 Bit/Unicode version which might indicate why it tends to print rather a strange selection of fields from some of the classes. 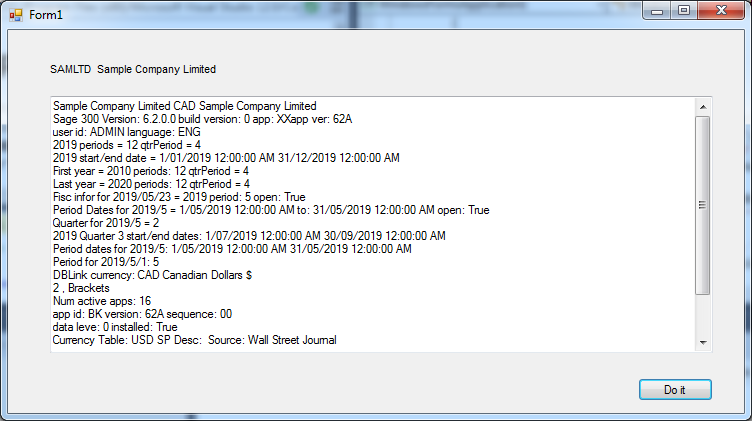 The sample program for this article is a simple WinForms application that uses the Sage 300 ERP API to get various information from these helper classes and then populates a multi-line edit control with the information gathered. The code is the dotnetsample (folder or zip) located in the folder on Google Drive at this URL. The code is hard coded to access SAMLTD with ADMIN/ADMIN as the user id and password. You may need to change this in the session.open to match what you have installed/configured on your local system. I’ve been building and running this using Visual Studio 2013 with the latest SPs and the latest .Net. The session class is the starting point for everything else. Besides opening the session get establishing the DBLink, you can use this class to get some useful version information as well as some information about the user like their language. From the session you get a DBLink object that is then your connection to the database and everything in it. From this object you can open any of our Business Logic Views and do any processing that you like. Similarly you can also get quick access to currency and fiscal calendar information from here. Of course you could do much of this by opening various Common Service Views, but this would involve quite a few calls. Additionally the helper APIs provide some caching and calculation support. Accessing the company property from the DBLink object is your quick shortcut to the various Company options information stored in Common Services in the CS0001 View. This is where you get things like the home currency, number of fiscal periods, whether the company is multi-currency or get address type information. Generally you will need something from here in pretty much anything you do. You can get a FiscalCalendar object from the FiscalCalendar property of the DBLink. In accounting fiscal periods are very important, since everything is eventually recorded in the General Ledger in a specific fiscal year/fiscal period. G/L mostly doesn’t care about exact dates, but really cares about the fiscal year and period. For accurate accounting you always have to be very careful that you are putting things in the correct fiscal year and periods. In Common Services we setup our financial years and fiscal periods assigning them various starting and ending dates. Corporate fiscal years don’t have to correspond to a calendar year and usually don’t. For instance the Sage fiscal year starts on October 1, and ends on September 30. This object then gives you methods and properties to get the starting and ending dates for fiscal periods, years or quarters. Further it helps you calculate which fiscal year/period a particular date falls in. Often all these calculations are done for you by the Views, but if you are entering things directly into G/L these can be quite useful. Some of the parameters to these methods are a bit cryptic, so perhaps the sample program will help with anyone having troubles. There are several classes for dealing with currencies, there are the Currency, CurrencyTable and CurrencyRate classes. You get these from the DBLink’s GetCurrency, GetCurrencyTable and GetCurrencyRate methods. There is also a GetCurrencyRateTypeDescription method to get the description for a given Currency Rate Type. The Currency object contains information for a given currency like the description, number of decimals and decimal separator. Combined with the Currency Rate Type, we have a Currency Table entry for each Currency Code and Currency Rate Type. Then for each of these there are multiple CurrencyRate’s for each Currency on a given date. So if you want to do some custom currency processing for some reason, then these are very useful objects to use. The sample program for this article has lots of examples of using all of these. Remember to always test your programs against a multi-currency database. A common bug is to do all your testing against SAMINC and then have your program fail at a customer site who is running multi-currency. Similarly it helps to test with a home currency like Japanese Yen that doesn’t have two decimal places. This was just a quick article to talk about some of the useful helper functions in our Sage 300 ERP .Net API that help you access various system data quickly. You can perform any of these functions through the Business Logic Views, but since these are used so frequently, they save a lot of programming time. I happen to be on holiday this week on the Sunshine Coast (in BC, not Aus). 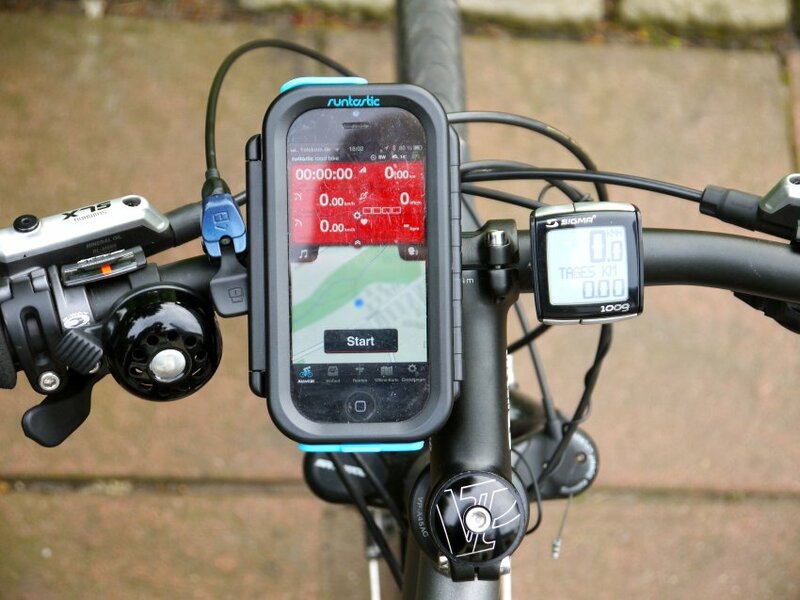 I’ve doing a lot of running and cycling so I thought I would blog a bit on how new devices like GPS watches, step counters and Phone Apps are helping track sports. I have a Garmin GPS watch and an iPhone 4s. So what can I do with these and what is the potential as these devices improve? This year Sage is again participating in the GCC (the Get the World Moving Coporate Challenge). Basically you form teams of 7 co-workers and each of you wears a pedometer for the duration of the event. You then enter your steps, meters swam and km cycled into the website each day. You then are tracked as you walk around the world and compete with other teams, either generally, within your company or within your area. The website is quite good, provides lots of useful information and tips on how to improve your health and fitness levels. 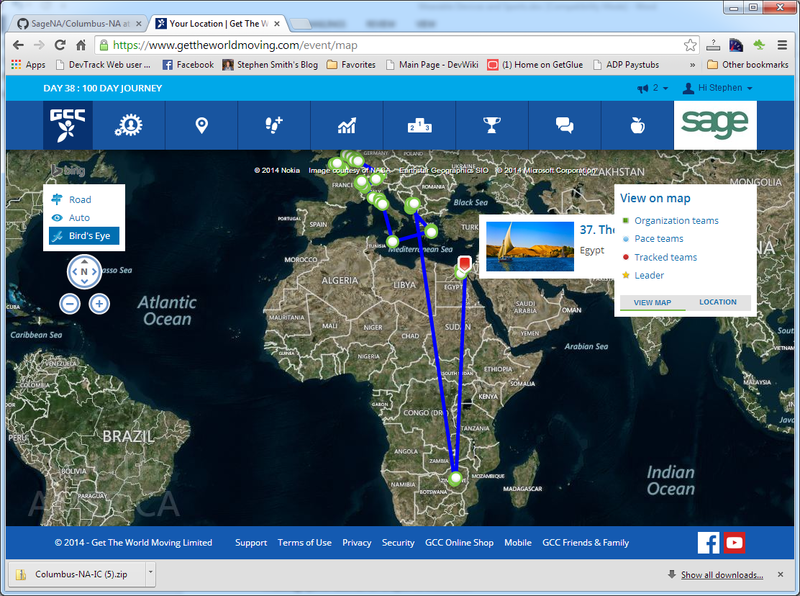 To do this tracking just requires a pedometer and their website. No other high tech gadgetry required. It will be interesting to see if more low tech solutions like this one (though the web site and pedometer are both fairly sophisticated) or solutions requiring more hardware like smart watches and extra devices will become the norm. There has been a lot of talk about Apple, Google and Microsoft coming out with smart watches this fall. Further several manufacturers like Samsung already have devices on the market. Then there have been a number of failures like Nike’s entry in this field. I think a lot of these companies have been looking at the success Garmin has had here. Garmin has transformed itself from manufacturing standalone GPS’s (which have now largely been replaced by functionality built into every phone) to making quite useful GPS sports watches. The watches tend to be a bit bigger than a normal watch but still not uncomfortable to wear when running. Perhaps not the greatest fashion accessory, they are really quite useful. Besides recording your speed, location, distance and elevation in great detail, they also have heart rate monitors to give you quite a bit of information. 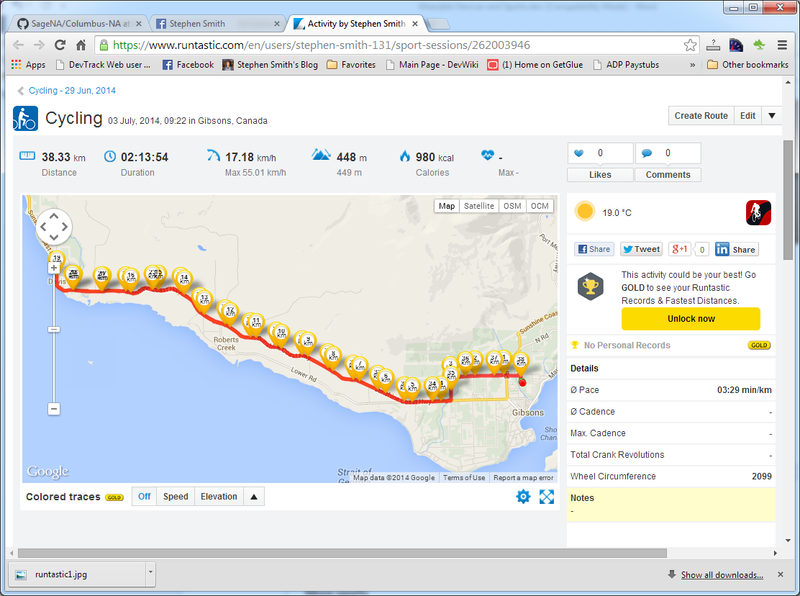 Then they have a web site that is no extra charge to store and share all your routes and runs. For instance here. The info is collected by the watch and then you upload it to your PC when you get back and then from there to their web site. Generally this then gives you all sorts of metrics where you can see how you did, your pace every kilometer, how you did on uphill’s and downhill’s, etc. You can then track your progress and have a good idea of how you are doing. There are quite a few fitness tracking apps for the iPhone. I just chose Runtastic because I liked the dashboard display in their app store ad. But otherwise it’s been fine, except for a bit too much promotion for the pro version. There are ads in the app and web site, but at a reasonable level, I think for the service you are getting. There are a lot of attachments available to mount your phone on your bike; however, I’ve found that doing this really drains your phone’s battery quickly (i.e. in about an hour) and so isn’t really all that practical. More typically it’s better to leave the display off since then it doesn’t seem to use that much battery. Also if you stop to take pictures or something, make sure you switch back to the app first. The iPhone doesn’t have good multi-tasking, so unless the app is the active one, it probably won’t be doing anything. Once you are finished your ride, the app uploads the data to the website and allows you to share what you are doing via social media (as any of my Facebook friends know). For instance this one here. 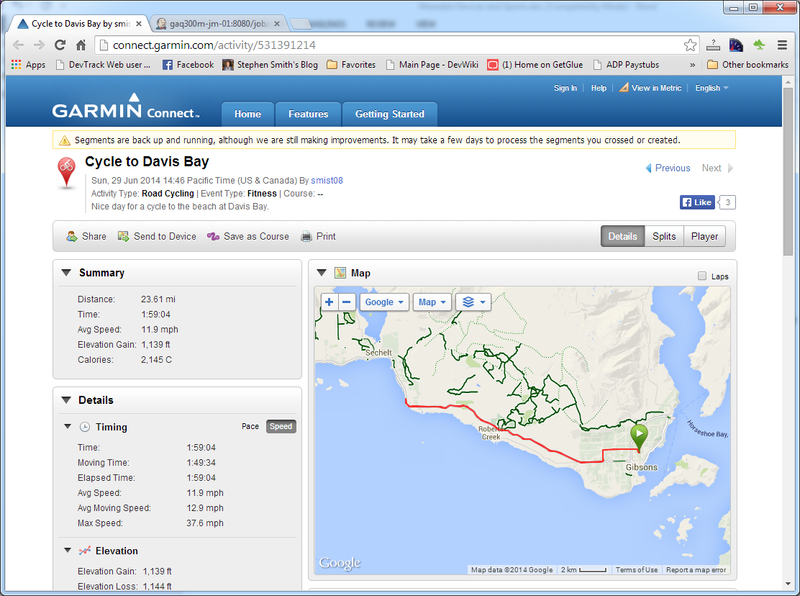 Like the Garmin website, this one gives you lots of information and makes it easy to track your progress as you try to improve your sport. I think that companies like Apple are looking at this market and hope it is a bit like the early MP3 music player market was. Then a company like Apple could come along, redefine the market, make it dead simple and create a much larger market than what the early technology startups could achieve. Whether Apple can repeat the iPod success in this market is yet to be seen. And they are certainly going to face a lot of competition as Microsoft and Google are hoping they can do the same thing. Better battery life. Operating with only a couple of hour’s batter life is insufficient. This should really be a week. Better durability. They can’t just fry when they get a little wet in the rain. Cycling and running are outdoor sports performed in any weather. Athletes don’t want extra clothing or gear to keep their watch dry. Further it would be great if these work for swimming. After all there are already a great many regularly triathlon watches that work great while swimming. Intelligent support for more sports. Useful metrics gathered while golfing for instance. What about soccer, football or hockey? Do not require a separate data plan. If you have to pay $50 per month to a cell phone provider then they are dead in the water. Another area where there is great research going on is developing more sensors that measure things like blood glucose levels, blood pressure, etc. It will be interesting to see how tracking these additional metrics can help athletes. There are also appearing apps that intelligently use the Phone’s camera to do things like analyze golf swings and tennis strokes. As these improve we may reach the stage where casual players can get real professional coaching and feedback right from their phone. On the flip side, there is a lot of concern about the possible privacy implications of these devices. For instance if I record heart rate monitor information and it starts detecting abnormal behavior, could an insurance company find out and cancel my insurance? Could it be used in other adverse ways? Generally this sort of medical information is very protected. Will these devices, services and web sites offer the necessary levels of personal privacy protection? Will I find out I have a heart condition because suddenly I start receiving ads for defibulators and pace-makers? There is certainly a lot of concern about this out there and there have been many Science Fiction stories about the possible abuses. Hopefully these won’t all turn out to be prophetic. By Christmas shopping season we are going to be inundated by new intelligent watches and other form factors that can help us track and improve our fitness levels. They will track all sorts of metrics for us, provide feedback and even professional levels of coaching. It will be interesting to see if this sparks a greater level of interest in fitness and sports. Maybe these will even help with the current epidemic obesity levels in our society.